Don’t forget to vote for us today and every day for Best Cause Blog in the DogTime Petties Awards. Click here to vote. « A Funny Thing About the Petties Awards…..
I’ve been voting! Love June Buggie’s advice!! MEOW! That means thank you…… or maybe it means feed me cheese. MEOW! I think that translates into rabbit somehow. Google Translator was useless though. Good advice!!! We’re voting for you every day!!!! Voted. I was able to vote before 24 hours lapsed. Whoa! We’ll have to figure out what the trick is. Hi June Buggie! Great to hear your rants!We missed you and your rants! MEOW! That means either thank you, or please pass the lasagna. MEOW! Caturday is the day of the gods. I like the way you think! Purrs…..
MEOW! That either means you’re a good friend, or that you smell like a pizza. Headed off to vote now! MEOW! That either means you smell like a dog, or….. no, you smell like a dog. You are so right June Buggie! We voted! MEOW! That either means I appreciate it, or I just horked up a hairball. 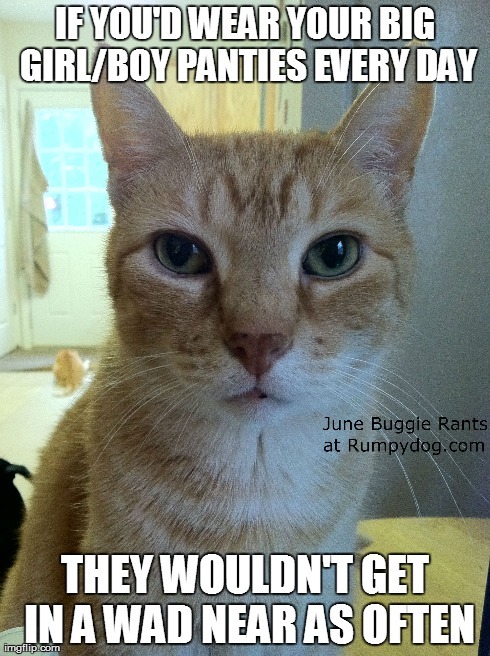 Well, yes, June Buggie … that’s very true! LOL! Oh yeah – I love this! !